Shop our Collie Gifts and find something special for yourself or the Collie lover in your life. We offer a variety of handmade items, including Collie mugs, wine stoppers, dipping bowls, treat jars, sugar bowls and creamers. And all of our Collie merchandise is made here in our Califonia studio, so you can be sure you're buying something made with love and made in America. It is important that you have a selection of coat cotlors to choose from, so we offer our Collie Gifts in 3 different coat colors - sable and white, mahogany and white, and blue merle. And, if these coat colors are not specific enough to adequately match your dog's markings and colors, you can have your Collie Merchandise customized by using the "custom" option on the item's page (a small art gee will be charged for all custom work). 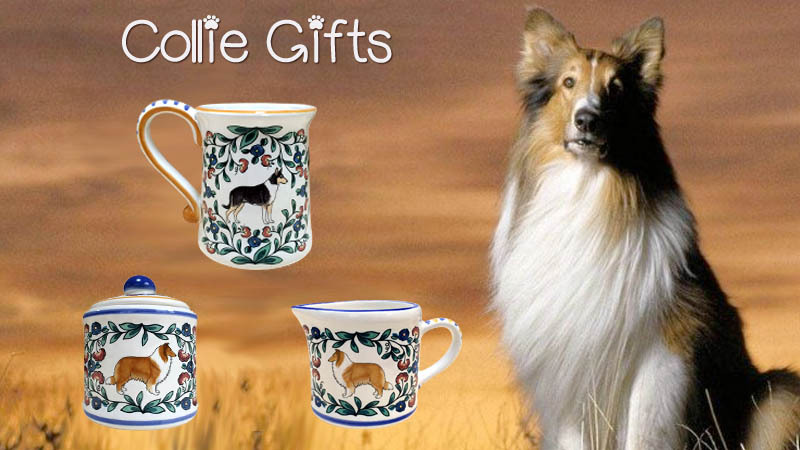 Our Collie Gifts are made of stoneware, so they're as durable as they are pretty. They are oven, microwave, and dishwasher safe. And, we use only non-toxic, food safe glaze and decoration, so you can use them without worry. The Collie is known for its elegant good looks. They were a favorite breed of Queen Victoria. Then later, Hollywood discovered the breed and produced Lassie, resulting in the breed's international recognition and popularity. Most Collies today come from lines that have not been required to work for generations, but many still display ability and inclination for herding. Collies often compete in AKC sanctioned herding trials with Shetland Sheepdogs, Welsh Corgis, German Shepherds and the other herding breeds that are not often used in farm fields today. And, the American Working Collie Association promotes the use of Collies for herding, carting, and a multitude of other uses. Collies of today perform other types of work stemming from their gentleness and sweet temperament – they make excellent therapy dogs, companions for the handicapped, and search and rescue dogs. Collies are easy to train, safe with, and extremely protective of, children, and make good watchdogs. We hope you find the perfect Collie Gift!